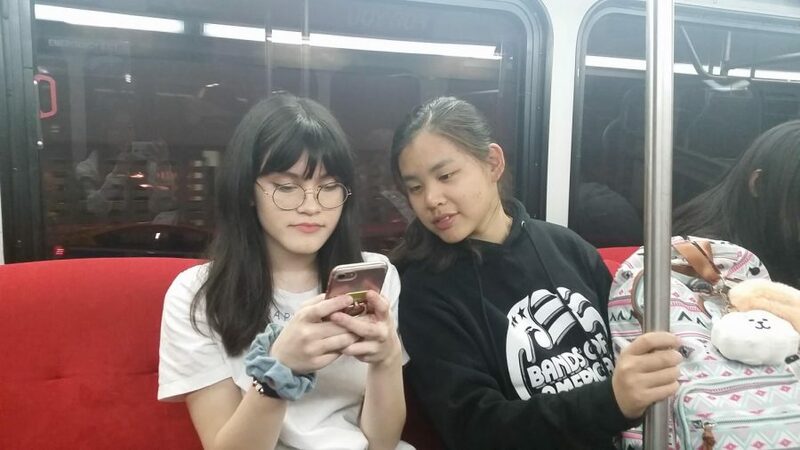 Victoria Chandler '20 and Michelle Huang '19 ride the bus in Los Angeles. Eight students made their way to Los Angeles on Friday, Jan. 25 to compete in an upcoming dance competition and show hosted by JTBC, a prominent South Korean broadcast company. The students went as KCROOKD, an informal dance group that they created with friends several years ago, and competed as representatives for the group. The show is Stage K, a broadcasted competition where foreign K-Pop fans around the world can participate in a dance cover contest for the grand prize of dancing with the winner’s favorite idols on stage. Stage K consisted of two preliminary local rounds before the main round starts in South Korea. 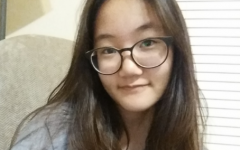 The first round was an online application and a video audition, which all the applicants, Victoria Chandler ‘20, Katie Chung ‘19, Michelle Huang ‘19, Michelle Lee ‘20, Regina Nababan ‘20, George Ruhlman ‘20, and Elizabeth Wolf ‘20, passed. “I expected [to pass the first round] since we were scouted to audition but was still very pleased that we had passed,” Nababan said. The second preliminary round was held in Los Angeles on Jan. 26 and Jan. 27. Accompanied by Melinda Barrett ‘20, KCROOKD’s general manager, and four parent chaperones, the seven students had a lot to prepare for their audition. The students competed as one group of four and one group of three for the competition, split as KCROOKD A and KCROOKD B. As required by the show, both groups prepared two to three songs of at least a minute each for the second round. “I practiced on my own for about two hours every other day and on the week of I would stay up late going through the choreography,” Nababan said. After arriving in Los Angeles, the group of seven spent the next day in high anticipation for the audition later that day. Auditions were held at the Hudson Theatres, a set of theaters where Comedy Central frequently hold their shows. Once checked in, the group spent some time in the holding room practicing their dances among fellow competitors. Music played in the background as several cameras recorded the scene. Before long, the group was called in to audition. Although they were auditioning in two groups, all seven went into the audition room together. Both groups were awaited by two panels of judges and more cameras. After a short introduction of all seven members, group A went up first. Once group B finished, all seven members were asked to stand in a line to answer questions and add any extra comments. On the way out of the audition room, a camera was set up so that the seven members could talk about their feelings after the audition. To their surprise, the group was asked for an outside interview that lasted around 40 minutes. To celebrate the successful completion of their auditions, the total group of 12 headed to Koreatown for some Korean BBQ. The following Sunday was spent in downtown LA, visiting various shops and the Hollywood Walk of Fame. However, the future remains uncertain for the group. In the first preliminary round, the seven students sent their applications as groups and were accepted in their groups. Unlike the first round, the second round was judged individually. This meant that among the groups competing, only some members of the group may pass the second round. Not much information has been released yet about the logistics of the show, but those advancing past the second round will be given an all-paid trip to spend a week in South Korea where they will participate in the broadcasted show. Stage K preliminary rounds have already been held all around the world, such as Mexico, France, Thailand, and several other countries. The U.S was the last country to have preliminary auditions — one being in Los Angeles and the other in New York City. Winners chosen from every country will compete against each other in South Korea to determine the final victor that will get to perform with real K-Pop idols.